5 Trust in Yahweh with all your heart, and don’t lean on your own understanding. Proverbs 3:5-6 is one of those Scripture passages that have meant a great deal to me personally over the years. As a person who has had the tendency to trust in his own resources, the idea that I don't have to lean on my own understanding to manage life is very good news indeed. 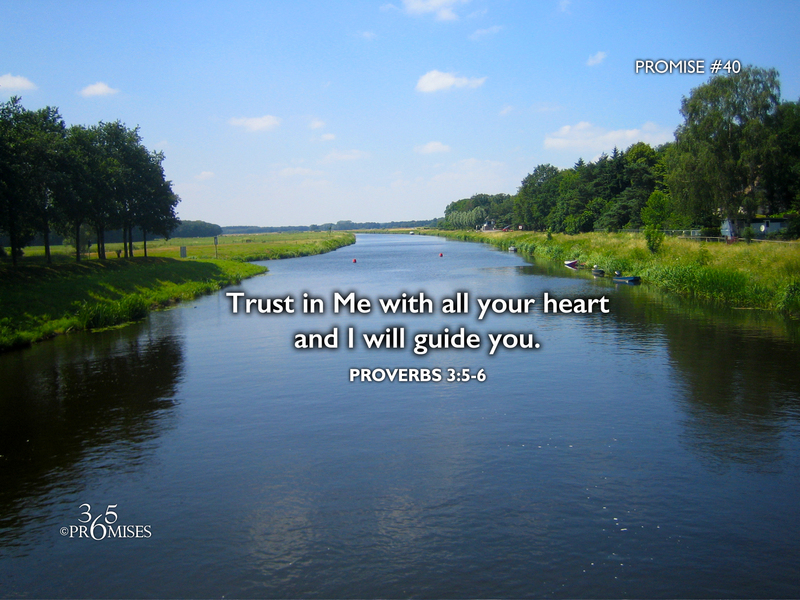 Today's promise encourages us to trust in the Lord with all our heart and not to rely on our own ability to manage life. The Hebrew word for trust in this passage is 'batach' which Strong's concordance explains this way... to be confident or sure, be bold, confident, secure, sure, careless, to hope, to trust. The more that we are convinced that God has our best interests at heart, the more we can put all our confidence in Him to steer our ship. The more we know that He really does love us and He is good, the more we will be able to give up control of our destiny and allow Him to lead us wherever we go. My prayer for each one of us is that we would be more convinced of the goodness of our God and Father than ever before so that we would trust Him a little more today than we did yesterday. In doing so, may we find that He is indeed a faithful Father who we can trust with ALL our heart!